DynaVox has revamped its special education software program, Boardmaker, for the web, adding reporting and analytics tools as well as new materials for educators. The program lets users create and alter boards consisting of text and symbols--pictures of objects and actions--as part of their lessons to help students with various speech, language, and learning challenges. The company is also adding symbol-adapted schedules, calendars, books, and educational activities to the cloud-based program. To help facilitate more personalized learning, it also features tools that let educators set academic, language, social, and behavioral goals, and track students’ progress as they make their way through lessons and activities. 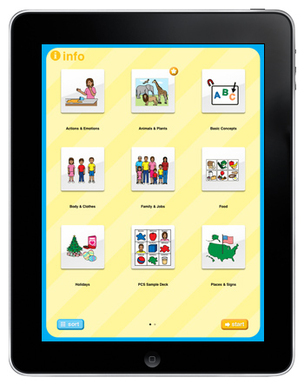 “I appreciate the ability to compile all of my students and their goals in one place, and the visual schedules will be extremely helpful to my students with autism spectrum disorder, who need to check off each activity as they go,” said Terri Porter, a speech language pathologist who uses the program, in a statement. A free Student Center iPad app, slated for release this fall, is also in the works.